Wow…when was the last time you could walk into a shop and buy a completely new 2D Mario game? Not since Super Mario World fifteen years ago if my calculations are correct. That’s a hell of a long time in a gaming climate where new games and hardware are often technically outdated within two years. When even Nintendo itself has barely touched the 2D platform genre in that time, can the risk of a whole new one pay off on a system that already has a perfectly functional version of Super Mario 64, the very game credited with killing them off? The answer is, mostly, yes. While New Super Mario Bros. is neither perfect nor the best 2D Mario, what it is is a great nostalgia trip and a worthy addition to the Super Mario pantheon. 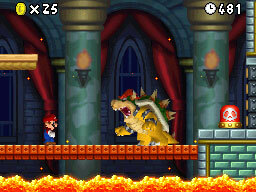 It may have been Mario himself who essentially killed off the 2D platformer, and so it’s him who arrives to revive it. There’s no better audience than DS owners, keen as they are for both classic and new gameplay experiences which is what NSMB delivers. The gameplay is nothing new – it’s Mario, after all – but the horsepower that the DS offers over the SNES allows it to use 3D graphics for silky smooth animation and effects that would have been almost impossible to do – at least not as effectively – in sprites. Everyone remembers the world in SMB3 where all the enemies are blown up to gigantic proportions, but here it’s Mario himself who gets to do it and use the ability to decimate enemies and obstacles. I’m not even going to go through the basics of the gameplay since I find it hard to believe that anyone hasn’t played one of them before. Mario games aren’t 2D platformers; they’re the 2D platformers. However, whereas Super Mario Bros. right through to Super Mario World absolutely nailed the balance of speed and inertia to make it accessible and addictive to play and master, NSMB feels slightly sluggish in comparison. I’ve played a lot of Mario World on the GBA recently and I’ve got the physics (such as they are) down so that judging leaps is second nature. As soon as I came to a big hole in NSMB and backed away to give myself an adequate run up I jumped straight into the hole. It’s not really an indictment of the game (nor my skills) because it’s its own beast and once you’re over the initial culture shock it play pretty much the same. There’s just something missing that fans of the classics might notice. Even so, it’s as full with great touches as any other Mario, such as when heading down a pipe into subterranean areas moves the action to the bottom screen. I almost didn’t notice it because it’s an action that feels so natural. My other concern with NSMB is that, unusually for Nintendo, in some ways it doesn’t feel like it’s been designed with handheld play in mind. You can only save the game when either spending coins to unlock new routes or finishing a castle which doesn’t lend itself to a quick blast between stops. There’s always the sleep function (complete with charming Mario interjections) but even the SNES ports on the GBA had the ability to save anywhere. Annoyingly the option unlocks when you finish the game for the first time so it’s in there, but why on Earth isn’t it there from the start? 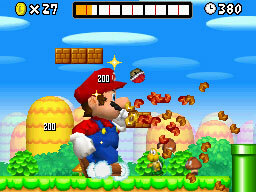 Niggles aside, New Super Mario Bros. is still an excellent game and an essential purchase for Mario fans. It’s nowhere near the epic length of Mario World, but has plenty of secrets to unlock since the initial playthrough can only hit six of the eight worlds. Also present are the minigames from Super Mario 64 DS which are left strangely uncompelling after losing their novelty to so many great full DS games, but nice to have nonetheless. So then, what we have here is a great Mario game. It’s just a little further short of platforming perfection than earlier games in the series have been. That said, in a world where it seems to be 3D or bust it almost becomes a peerless example by default.